Still, the victory did not come easy, as Ryan Miller was on his game early on, and Buffalo was able to capitalize on a turnover that lead to the game’s first goal. After a poor neutral zone turnover by John Carlson, Tyler Ennis was able to capitalize, as he slid a nifty backhander underneath a diving Michal Neuvirth to find the back of the net. In previous games, the Capitals seemed to sulk after surrendering the first goal of a game, but this afternoon, the Washington seemed to push even harder. A big hit by Alex Ovechkin sparked the crowd, and the Caps were able to force a turnover of their own in the offensive zone. After a failed clear by Buffalo, Mike Ribeiro dumped the puck down to Jason Chimera on the goal line, who then banked a puck off the side of the net. The rebound caromed out to Joel Ward, who was crashing the net, and was able to fire the puck past Miller to tie the game at one. A strong outing by Michal Neuvirth held the Sabre’s power play in check as the Capitals were a perfect two-for-two on the penalty kill. Meanwhile, it was the Capitals who’s power play came alive as Alex Ovechkin was finally able to bury his first tally of the young season, one that would stand as the game winning goal as well. Mike Green sent a beautiful cross ice pass from the top right point, down to the top of the left face-off circle, where Ovechkin patiently waited for the one-timer to secure the lead for good for Washington. 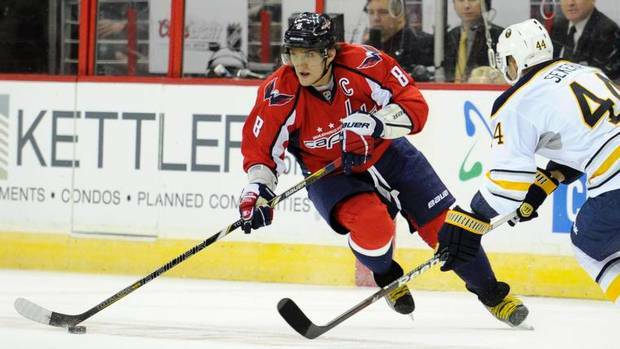 Ovechkin made things interesting, as he had a chance to ice the game for good by scoring an empty netter. However, he missed wide of the net, keeping the score at a one goal game for the remainder of the contest, adding nerves to an already on-edge Adam Oates who finally captured the ever-elusive first win in his head coaching career. This Capitals team still has work to do. They still showed signs that at times they were confused as to what and where their assignments were on the ice, but they seemed to be doing less thinking, and more reacting, which is always a good thing as a professional athlete. Many of the Caps stated that they felt that they carried some momentum over from the New Jersey game into this afternoon’s tilt with Buffalo. Troy Brouwer said, “We liked our game Friday night [against New Jersey], despite the loss, and then we carried it over to tonight.”. Let’s hope the same can be said for Tuesday, as the Caps will travel north of the border for the first time this year and take on the streaking Ottawa Senators. Ottawa, currently tied for fourth in the conference with seven points, boasts a record 3-1, and has the hottest goaltender in the NHL in Craig Anderson, who currently has posted a .975 save percentage, with a .74 GAA. As Washington packs their bags for Canada, they will certainly need to bring any momentum they gained from this afternoon if they hope to add to their first win.